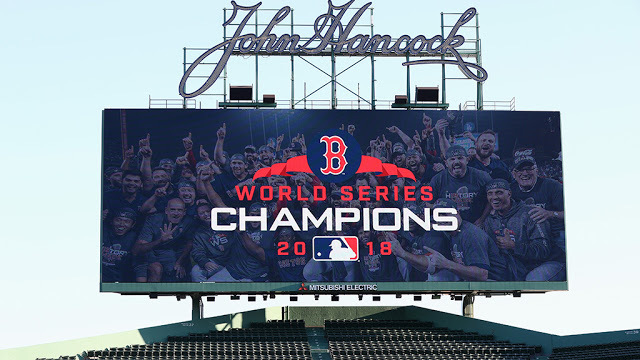 The Boston Red Sox will receive their 2018 World Series championship rings before the start of today's Home Opener at Fenway Park. Despite propaganda to the contrary from fake-sports ESPN, there will be no booing from the 37,000 plus in attendance. Granted, the 2019 Carmine Hose have gotten off to a poor start (3-8), but Boston fans are far more sophisticated than the denizens of Bristol, Connecticut think. We don't throw snowballs at Santa up here. In any event, Dustin Pedroia will start his first game since last May—batting seventh and playing second base. The red-hot Mitch Moreland will hit third and play first base. Staff ace Chris Sale will try to correct whatever the heck is wrong with him and improve on his first two crappy starts. Clearly, with 151 games left to play, anything can (and most likely will) happen. Play ball!